Summer of 2014 saw an incredible run of swell. But any surfer worth their saltwater, knows that winter is the best time. Swell producing storms are more frequent and much closer to our coastline. 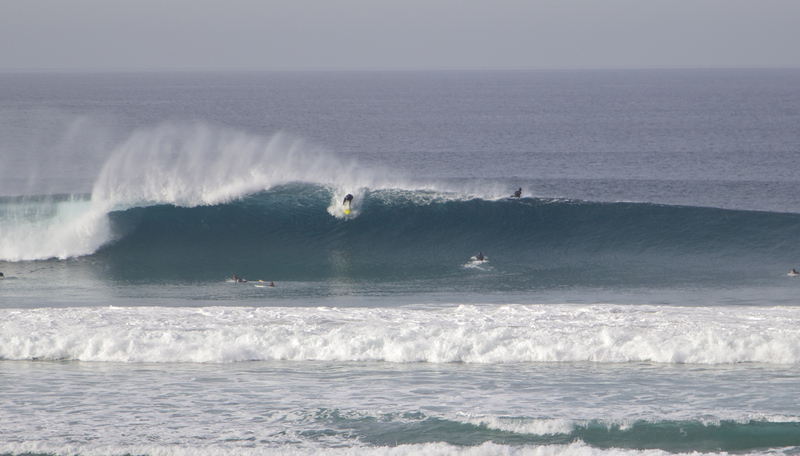 Regardless of the colder water and shorter days, winter produces the best swells. The North Pacific Ocean (NPAC) generates some of the largest and most powerful storms on Earth. Let’s investigate the genesis of these storms and track their energy across the Ocean to our coastlines. 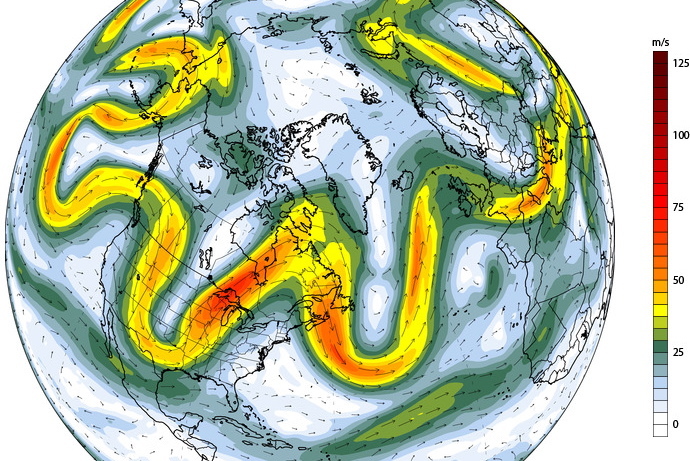 The Polar Jet Stream: a major factor in the production of our winter surf. What is it? More importantly, where is it? It’s a belt of strong, upper-level winds that blow across the mid-latitude atmosphere. Here, the gradient between the cold/dry polar air and the wet/warm tropical air is strongest. Known as the Polar Front, this region funnels the Polar Jet Stream from west to east across the North Pacific Ocean, North America to Europe and beyond. At between 23,000 and 39,000ft. above sea level and 100mph+, this enigmatic force impacts global weather. 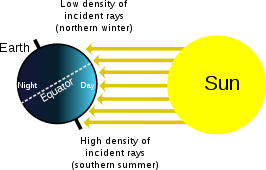 As the Earth orbits the Sun over the course of 365.25 days, tilted on its axis, different parts of the planet receive more solar energy than others. The Northern Hemisphere is pointed toward the Sun in the summer. The temperature gradient between the North Pole and equator is weaker because the solar energy reaches farther north. Hence, the Polar Jet Stream is positioned close to the Arctic and the North Pacific is quiet. In our winter, the Northern Hemisphere leans away from the sun, strengthening the gradient and moving the Polar Jet Stream south over the Pacific Ocean. This is the fuel that feeds energy into the storms that generate our waves. The Jet Stream doesn’ t flow in a straight line, instead troughs and ridges form along its length. Rossby Waves meander the jet, unsettling the atmosphere. As the jet stream flows along these bends, it speeds up, taking air from surface-level high pressure upward. This creates low pressure that begins to intensify as it spins with the Coriolis Effect. The pressure gradients tighten, wind speed increases and kinetic energy is transferred into the water below. On the surface, the warm Kuroshiro Ocean Current brings heat from the equator up the coast of Japan and into the Northwestern Pacific. The cold Oyashio Current flows south from the Arctic Ocean. The Westerlies blow cold, dry wind across Asia and out to sea near Japan. In the winter, these forces collide at the Polar Front. 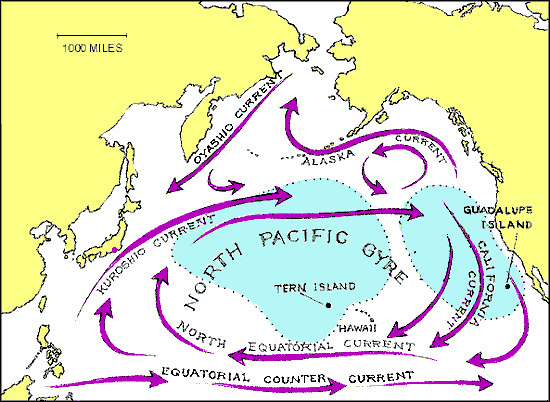 This is the genesis of many North Pacific swells. The Polar Jet Stream moves these systems to the east, first near the Kamchatka Peninsula, then past the Aleutian Islands and into the Gulf of Alaska. Purple, black, yellow and white blobs marching across the NPAC: the active storm track that we all love to see. The direction the storm takes is of utmost importance to swell production. Sometimes they track north into the Bering Sea. This is poor for California and Hawaii swell production because the energy is moving away from our coastlines. Ideally, the storm stays to the south, intensifying as it passes north of Hawaii. Moving east, the storm slams into a giant ridge of high pressure off the California coast. The system and it’s inclement weather are spun north towards Canada. But the goods are delivered. Swell trains march across the Pacific, slamming the sunny California coast with perfect surf…ideally. If the high pressure ridge is weakened off the coast of California, the storms can stay south and deliver (much needed) precipitation. These storms can also deliver very intense, shorter period, stormy groundswell. La Nina conditions represent a weaker and more northerly Polar Jet Stream that supports high pressure in the Gulf of Alaska with a less active NPAC storm track. El Nino brings the jet to the south, setting up low pressure in the Gulf and a more active storm track. Large, intense swell generated by close proximity storm. There are innumerable variables that dictate the production and quality of waves at any location. From the size, strength and track of a storm to the local winds and bathymetry. Forecasting accuracy continues to improve as computer and satellite technology advance. Along with our understanding of the large-scale connections between atmospheric phenomenon. So when the Polar Jet Stream troughs, we can rearrange our schedules to enjoy the energy.